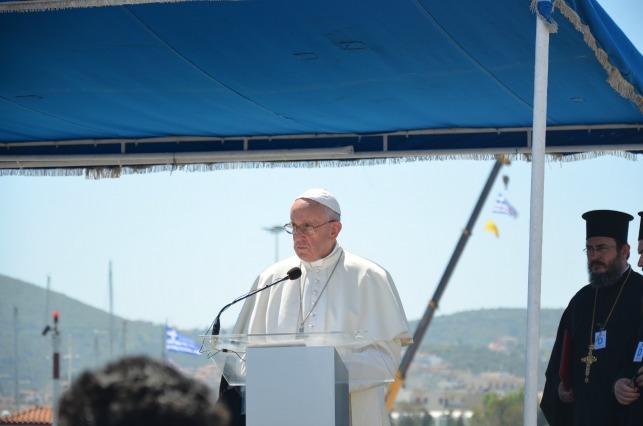 The pope met refugees on Lesbos Saturday 16 March. He travelled with Ecumenical Patriarch Bartholomew I, spiritual leader of the world’s Orthodox Christians, and Archbishop of Athens and All Greece Ieronymos II, head of the Church of Greece. “This is a trip marked by sadness,” said Pope Francis, calling the crisis the “greatest humanitarian catastrophe since World War II”. Lesbos has been at the centre of a refugee and migrant influx that’s seen over a million people cross to Greece last year and 150,000 in 2016. Over 300 have died this year making the crossing. Making a banner for Pope Francis at the Caritas hotel for refugees and migrants. Credit: Caritas Hellas. The joint trip comes shortly after the start of a European Union-Turkey deal under which any migrant arriving on Greek islands after 20 March will be detained and returned to Turkey unless they successfully apply for asylum in Greece. “Only those who see the eyes of those small children that we met at the refugee camps will be able to immediately recognise, in its entirety, the ‘bankruptcy’ of humanity and solidarity that Europe has shown these last few years to these, and not only these, people,” said Archbishop of Athens Ieronymos. “You are not alone,” said Pope Francis. The pope and the other Christian leaders met with hundreds of people at the Moira detention centre. It holds about 3,000 people. “As people of faith, we wish to join our voices on your behalf. Do not lose hope!” he said. Pope Francis met with Caritas Hellas staff on Lesbos. They gave him a photo album, some children’s drawings and a bouquet of flowers all made by refugees staying at a Caritas-run hotel on the island. The hotel is for very vulnerable cases, such as pregnant women. “As people of faith, we wish to join our voices on your behalf. 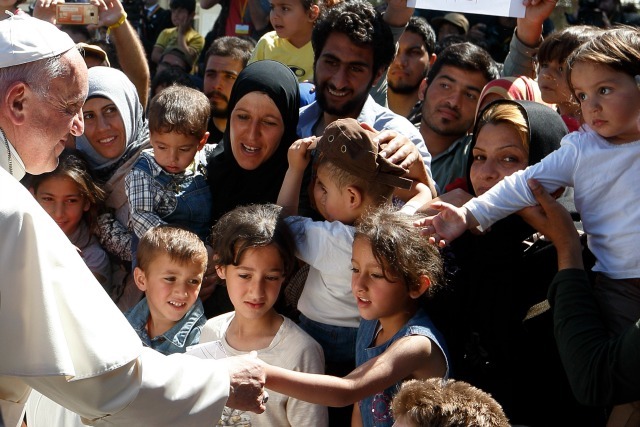 Do not lose hope!” said Pope Francis to the refugees on Lesbos. Credit: Caritas Hellas. When ISIS launched a major offensive, Afran and his family fled to the Turkish border. The family lived in Turkey for over a year. Afran paid for an artificial leg. They had a baby. He said there was no future for the family in Turkey. “There is a lot of racism against Kurds. We were running from war. We didn’t feel safe,” he said. They decided to make what he called the “journey of death” to Europe. “Finding a trafficker was as easy as walking down the street,” he said. 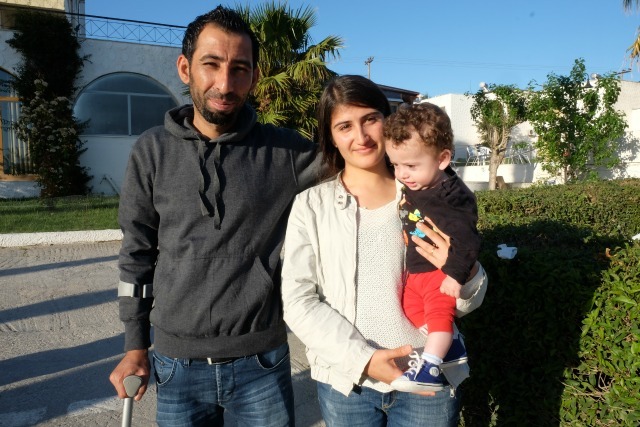 “We stayed on the beach for 15 days waiting for the dinghy to Lesbos. It was cold and the baby became ill and had to go to hospital. I was so stressed I couldn’t eat. Now they’re staying at the Caritas hotel, waiting for their asylum request to be processed. They receive milk for the baby, a room, clothes, food and medical treatment. Leonard Meachim teaches English at the Caritas hotel to the Syrians. He is a volunteer who moved from Liverpool to Lesbos 30 years ago where he lives with his Greek wife. 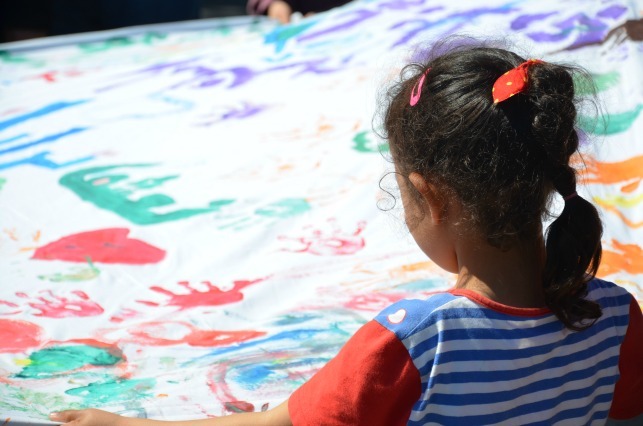 “When the boats began to arrive last year, we started with ad hoc distributions as community volunteers,” he said “Then Caritas Hellas helped us to organise regular distributions of sleeping bags and mats. Now with the EU-Turkey deal to detention centres, “people are being traded: One Syrian here for another one in Turkey,” he said. “From the beginning you see them as people like yourself. They’ve seen lots of tragedy. Children have seen things no child should ever see. They’ve seen their family members being killed and abused. Nobody makes the trip unless they absolutely have to,” he said.